The epigenetic mechanisms entailing acetylation and deacetylation of histone proteins are two critical post-translational modifications. 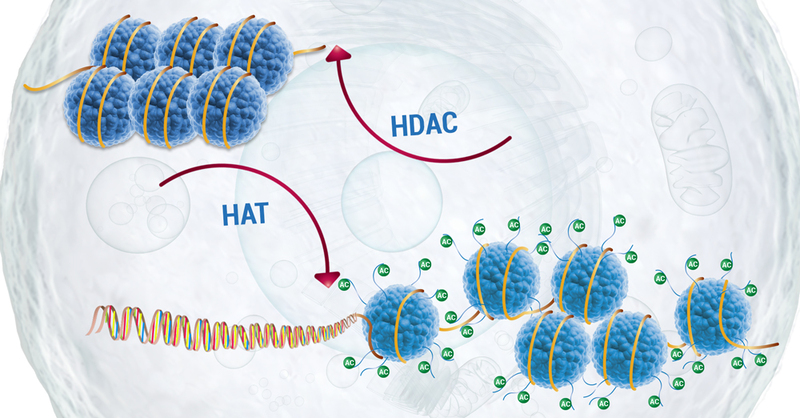 Histone deacetylases (HDACs) are a part of a vast family of epigenetic enzymes playing a crucial role in the gene silencing, which controls the gene expression. Members of HDACs are important cellular tools in the maintenance of chromatin architecture and gene transcription. HDACs remove the acetyl (O=C-CH3) group from an ε-N-acetyl lysine residue on a histone, which allows the DNA to wrap around histones more tightly, thereby impeding the gene expression process. HDACs play a key role in cellular processes such as cell proliferation, cell cycle regulation, apoptosis, and cell differentiation. Altered expression or mutation in the members of HDACs have been observed in many human diseases such as cancer, inflammation, neuropsychiatry, skeletogenesis, cardiovascular growth and more. Signalchem offers a diverse and comprehensive range of active HDACs to facilitate in vitro studies on epigenetic mechanisms and related human diseases. Our active HDACs and sirtuins have been validated using Promega’s HDAC-GloTM and SIRT-GloTM technology respectively.